A Perry guitar represents the finest in design, materials, and craftsmanship. Each instrument is the product of a deep commitment to make the most complete musical instrument possible, one with the potential for the fullest range of musical expression. Perry guitars have a full, open sound with deep, well defined basses, clear singing trebles, and are exceptionally well balanced. They have a broad dynamic range and an extensive colour palette, and are capable of excellent projection. They are heard in many of the world’s concert halls in both solo and chamber music performances. Perry guitars are made using well-aged spruce, rosewoods, maple, cedar, mahogany, and ebony. We work using traditional methods to produce a limited number of instruments each year. Our uncompromising standard of craftsmanship pertains to all areas of the guitar – structural integrity, playability, and all aesthetic details, but most importantly to quality of sound. Our work is inspired by the great makers of the past, notably Torres and those who were inspired by his work before me (M. Ramirez, Garcia, Simplicio, Hauser, Romanillos). A Perry guitar contains no carbon fibre, has only one sound hole, and one soundboard. Instead, it uses traditional designs that are known to produce great guitars. Perry guitars fall into two categories: Perry concert guitars, which use traditional designs and materials in an instrument which meets the demands of today’s guitarists; and historical reproductions, several of which are represented on this site. 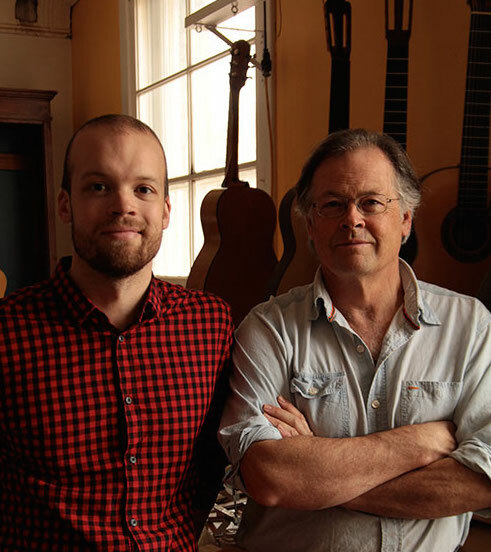 I am very pleased to say that my son Jesse has now joined me in the workshop, and we work together creating Perry guitars.